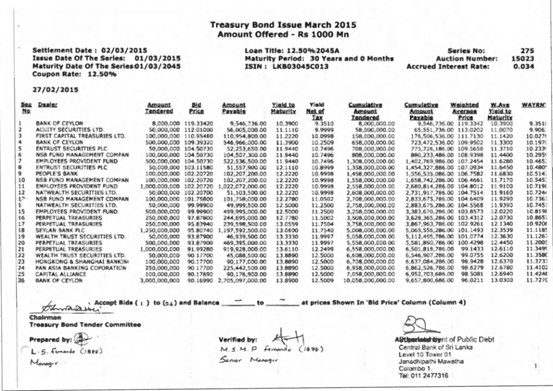 Full Story Of Treasury Bonds Issue: Who Scammed Whom? Somewhere in late February 1995, Ajit Jayaratne, former Chairman of the once venerable Forbes Group of companies, Chandana Edirisinghe, then managing director of Forbes stock brokers and myself (I headed Forbes Research) were waiting in an anteroom at the plush offices of Barings Bank in Singapore. Forbes stock brokers, who at that time controlled more than 50% of the annual transactions carried out in the Colombo stock market were invited by James Bax, then head of Barings Securities in Singapore to sign a Joint Venture - a JV which could have been a game changer for both Forbes and for Sri Lanka given Baring's exalted position as the best research driven equities trading house for Asian securities within the large fund management houses at that point of time and Forbes Securities ability to source deals back in Colombo. We were negotiating with Baring's for about three months following the breakdown of a previous joint venture talks with Jardine Fleming in Hong Kong. I had previously been employed with Jardine Fleming and returned to Sri Lanka in advance of that JV. An unforeseen legal hitch prevented it from being realized and Forbes management had high expectations for the Baring's JV. It did not take us long to realize that something was amiss. Brokers are prompt when it comes to appointments. Money is to be made and time is of essence. We were made to wait for more than 30 minutes before one of our contacts walked out and gave us the bad news that Bax would not be able to see us that day and in fact it would be difficult to say when we can meet again. Bax did appear five minutes after, to profusely apologies and to show us the door. We were only told that a crisis of a sort had erupted within the Baring's office and that needs their immediate attention before they can think of anything else. By the time we returned to our hotel rooms in Orchard Street, the buzz was on the streets and colleagues from Colombo and friends from Hong Kong were calling into the hotel switchboard. Nick Leeson had happened. Leeson, a young derivatives trader, who rose through Baring's back office ranks to become the back office manager at the Singapore office, was also given unfettered access to trade bonds and derivatives - simply based on Leeson's charm and powers of persuasion. This was a time when trading was still a gentleman's business and your word was your bond. Millions of dollars of business done based on a phone call and nothing else. Leeson was unfortunately not a very bright trader, nor did he know the economics or the techniques of trading. However, he knew how to create false accounts to hide quick losses that were recuperated quickly in the course of normal trading. And there was no one to check him, because he continued to be the head of the back office as well - so he was also in charge of settlement, (when accounts are settled - buyers and sellers paid) creating and maintaining margin accounts and fixing the margins for the clients. There had been some warnings; one among them had actually come from a former colleague of mine who joined Baring's from Jardine Fleming, questioning the risk profile of having the back office manager also heading the trading desk. Those warnings went unheeded - very simply because at first glance, Leeson was Baring's most successful asset - he alone seemingly produced more profit in 1994 -than the whole of Baring's much vaunted equities desk. In a nutshell, Leeson was betting the bank, and I mean the whole bank, that Japan’s Nikkei index will rise. He kept on buying Nikkei futures, an instrument that committed Baring's to buy more than U$27 billion of Japanese equities and bonds at a future date. He was supposed to hedge these trades by betting in the opposite direction (or short selling) on the Japanese indexes trading in the Singapore Stock Exchange – money was to be made in the slight differences or anomalies between the pricing of these instruments between the two exchanges – or arbitrage. Leeson made one major miscalculation - he did not consider havoc nature can impact - the Kobe earthquake happened and Japan entered into a free fall. Instead of cutting losses and admitting his mistake, he bet more to cover the rapidly increasing margin calls, and bet more and bet more. Moreover, to he did not cover these buy short selling in Singapore – instead he maintained a false account – account number 8888 that falsely showed he was covering the trades. Other than for the fabulous bonuses he enjoyed, Leeson did not make any personal money. He probably lost some too. It was that morning when we were at James Bax's anteroom, Ajit Jayaratne, Chandana Edirisinghe and myself, when the house of Barings, once called the Sixth great Power became a House of Cards that crumbled rather rapidly thereafter. When the investigators started to go through the cards, and when the blame had to be fixed, even though the evidence very clearly pointed to Leeson three of the most senior managers at the Barings, including James Bax were stripped of their licenses to operate as Financial Market representatives and had to leave the industry. Barings itself was bought for the total sum of One Sterling Pound by Dutch Bank Ing, and then merged with Ing operations while some units were sold off. It was somewhat ironic that not many months after our visit to James Bax´s anteroom, I had to report to the Securities Exchange Commission (SEC) then headed by the indomitable Ariththa Wikramanayake, now the precedent partner at Nithya partners, a leading law firm in Colombo, of an unusual trading pattern - while Forbes was still the leading stock broker in Sri Lanka at that time, dominating more than 50% of the market, a sizable portion of those trades happened in less than five accounts, all linked and managed by a senior director of the company. Given that we were dealing with the top fund managers in Asia and our clients included the largest investors in Sri Lanka, one would have thought that these five accounts belonged to these large funds or investors. It was not the case. Instead, they were all accounts held by friends of the senior director concerned, other than for one – which turned out to be an investment vehicle for another senior director, who had given the discretionary authority to the first senior director to invest on his behalf. Forbes was by then negotiating with Credit Lyonnais Securities Asia (CLSA), today the most prominent of Asian brokerage houses, for a JV, its third attempt. CLSA wanted the list of our top existing clients, as the envisaged commission structure would have excluded a commission split from these existing clients. CLSA was also by this time providing us with a steady stream of large orders, one particular order worth US$ four million for shares of Aitken Spence, approximately 10 per cent of Aitken Spence issued shares at that point of time. What concerned SEC was that quite a number of transactions in the five accounts under scrutiny involved Aitken Spence shares – all done after the initial CLSA order came and all sold to CLSA to fulfil the single US$4 million order. In effect, these five accounts were used to front-run, buy a share at a lower price to a different account, with the knowledge that an order for the share at a higher price exists in the company´s books, and then off-load the share at a higher price to the original order. There were substantial profits made in this particular instance as the market was not aware of the large order – instead the market was only shown dribs and drabs of interest keeping the share prices down until all the shares necessary for the big order were collected and sold to CLSA at a higher price. SEC did not have any rules to prevent this type of trading at that time – the rules against front-running were bought in because of this incident. However, the senior director concerned had to leave the industry. My role as a whistle-blower did not sit very well at Forbes, specially because at this time the main board of directors were also negotiating with Sir Philip Christopher Ondaatje to sell the company to Ondaatje´sLoewen Ondaatje McCutcheon (LOM) Corporation (subsequently renamed The Ondaatje Corporation or TOC). At a meeting with Garrett Herman, who was the CEO of LOM and who was visiting Colombo days after the sale agreement was signed, I presented the evidence before Garrett and Ajit Jayaratne, asking that appropriate action be taken. Unfortunately, this was not done and several days after I resigned – not purely because of the front-running saga, but also because of a couple of other factors, some personal and some professional, including a fundamental disagreement with the TOC buy-in of Forbes. It was a month after my resignation that I reported the matter to SEC, giving time to Forbes to take internal action if they so choose to. That did not happen. Since my employment with Jardine Fleming in 1989, I had invested my savings in two of Jardine Fleming managed investment funds. Even after my return to Sri Lanka in 1992 to head Forbes Research, I continued to invest my savings in these two funds, opting not to deal in shares in Sri Lanka as I was in a position of trust and privilege – Forbes Research had the enviable reputation of predicting market movements with about 85% accuracy and our word was followed closely by the market. Other than for the private placement of Vanik, of which I was closely involved, I had not invested in a single share in Sri Lanka during the time I was head of Forbes Research. I returned to Hongkong in mid 1995 to cover the Indian Sub Continent for CLSA, who abandoned their JV plans with Forbes once the front-running affair became known. I continued to invest my savings in the two JF funds, both managed by an exuberant, high performing and highly ambitious Scotsman, who was in a hurry to make his mark in the investment world. Most juniors at Jardine Fleming held Colin Armstrong in awe. His investment performances were legendary, a steady 25% in JF Pacific Securities Trust over a period of 5 years, the largest JF equity fund and the largest in Asia ex-Japan at that particular time and a spectacular 130% in the Ninja fund, trading in warrants and other exotic scripts. When six feet tall Colin strode through the corridors of Jardine Hose, people tended to step aside and let him pass. I had a weekly scheduled encounter with him – as the Corporate Communications Manager at JF, my job was to coax out the weekly investment management summary from Colin – not a simple or easy task. His summary was always the last to come from the 20 odd fund managers, but it was also arguably the most brilliantly written, so much so that phrases from his summaries still float around in my mind. Even if a single word was edited or cut out, most often due to space considerations and not because of style or fact, Colin will stride over to demand detailed explanations. It was much easier to deal with the head of the investment Team, Robert Thomas, than to answer the queries from Colin. Over time, Colin´s visits to my desk became less frequent and my visits to his more as he was taking an interest in the Sri Lankan market and I started to act in the capacity of the in-house research analyst for Sri Lanka. Jardine Fleming, along with Dr. Marc Faber, or Dr. Doom as he was called then, was the first to invest in the nascent Colombo stock market, immediately after the deregulation in 1990. At one time, JF, in particular the JF Pacific Securities Trust, held over 27% of the total free float, or 27% of all of the shares freely traded in the market. Given the size of the Pacific Securities Trust, this was still less than 5% of the fund size and were simple discretionary investments for Colin and Robert Thomas – they only wanted to know the growth prospects and whether there was enough liquidity in the market in the shares JF owned so that when it came to disposing the shares there would not be too much trouble. There were – Majestic City was one example where JF invested nearly 15% - I remember meeting with the Page family along with another colleague to discuss that particular investment. It was Jardine Fleming who pushed for the first Country fund for Sri Lanka, working with current Prime Minister Ranil Wickremesinghe who was then the Minister of Industries and his able secretary,A.S.Jayawardana, to change the capital investment laws, relaxing the strict regimes of foreign exchange regulations and bringing in new regulations to cover foreign investments in the share market, leading to the subsequent relaxation of the capital market. It was a US$25 million fund, a significantly large amount at that period of time. In another one of life´s ironies, the fund did not take place – while we were in the plane bound to United Kingdom for the planned road-show for the placement of the fund, a particular regulation was changed in Colombo, for reasons that I still haven’t been able to fathom, that made the placement untenable. So even while sitting at one of the most active dealing desks in Hong Kong, the CLSA equity-dealing desk, I continued to trust Colin and invest in the Ninja fund and the Pacific Securities Trust. I remember the kerchief Ajit Jayaratne wore the night before we were to meet with James Bax in February 1995. It is a memory that I associate with what was essentially a traumatic experience. The memory I associate with my savings being virtually wiped out is the third birthday of my daughter Oshani in August 1995, just two months after moving back to Hong Kong to work for CLSA. Nicholas Smith, a jovial and rotund Accountant had taken over as the chief compliance officer of JF somewhere in 1993. Before that, Nick was the director of Corporate Finance and was involved in the aborted launching of the JF Sri Lanka fund. His team had started to notice discrepancies in the trade recording activities of several fund managers in the run up to 1994, in what was one of the most, if not the most, successful years for JF. Business was booming to such an extent that JF Pacific Securities Trust stopped taking any new business, or issuing any new units, until the fund invested the cash it had stockpiled for three months in 1994. Another young Accountant, Peter Knott, deputy to Nick Smith, started to focus on Colin´s trades – it was a daunting task for two reasons, one the amount of trades involved and the other the mercurial prestige Colin enjoyed. Peter had joined JF around the same time I did along with Richard Mosley and we were friends who generally enjoyed our lunch together and occasional family outings. Mosley is now a head of a successful publishing company in Brazil after moving to Rio to set up Fleming´s investment banking arm in Brazil in 1998 while Peter is the CFO of the UK Green Investment Bank, after a successful career at JP Morgan and Standard Chartered Bank, where he was the Group Head for Operational Risk till January 2012 before moving to the Green Investment Bank. I had invited both Mosley and Knott for the birthday party, a small affair with friends and family. We were lucky enough get our old quarters back in an old converted mansion house, which once belonged to the Matheson Family (the Jardine part of Jardine Fleming came from the Jardine Matheson group, one of the most asset rich companies in Hong Kong) with a two-acre garden right in the middle of the Quarry bay country park in Hong Kong. The palatial dining hall of the old mansion became a common party venue for many of our friends. Upstairs, we lived in cramp quarters, sharing the rest of the building with nearly 26 others, an interesting mix of races, professions, and temperaments. By August 1995, our adjunct hall mates included some of our oldest friends, Alvin Sallay, Stephen Prins, Siva Illankesan, Duminda Aryasingha and Larry Campbell (and their families) all of us who made the move as journalists to work in the Hong Kong Standard in 1986 from the SUN and WEEKEND newspapers in Colombo. It was a boisterous and close crowd of friends who attended that party. Mosely and Knott did not attend at the end, but I did receive a call next morning to apologize for not coming and to inquire about my savings. Knott´s persistent inquiries made over a year had uncovered one of the biggest letdowns for many of us. Like with the incident at Forbes and Walker Stock Brokers, Colin had been practicing an insidious method of front-running, one that benefitted three of the funds that he managed, including his own personal fund and the high performing Ninja fund, but disadvantaged all the other funds, including the Pacific Securities Trust. At that particular period of time, the fund manager was not required to state in the buy or sell ticket (most often there was no ticket – the order was given over the phone and only when the settlement clerks comes up with the settlement sheets did the fund managers mark to which funds the shares should be credited or debited from) for which fund under the umbrella of funds he or she managed the trade had to recorded. What Colin had done was to record all the favourable trades to the three favoured funds, waited a couple of hours (at times more than 48 hours) and then record the unfavourable trades to the rest of the “disadvantaged” funds. It took more than a year for the dust to settle and all the inquiries to conclude. Armstrong was made to resign in September 1996 after being stripped of his fund manager license. Robert Thomas resigned not long after, taking full responsibility for what happened under his watch and two months later, JF´s much respected Chairman, Alan Smith left. Jardine Fleming had US$22 billion under management by August 1995, by far the biggest funds under management in Asia, ex-japan. The company had to pay back to the “disadvantaged” funds just over US$20 million, the amount that was calculated as the amount that the funds would have gained if Colin did not favour his three other funds. Colin himself paid a fine and is now rumoured to be playing a good game of Golf every day somewhere in Sussex, UK. The value of the funds came rapidly down and by the time I managed to extricate myself, my units had lost more than 70% of value from the highs of 1995. It did not take long for JF to fold down as a company, with Matheson´s selling their shares of JF back to Robert Flemings in London and Flemings in turn selling the entire entity to JPMorgan not long after. The Barings and the JF debacles were not the biggest or the most expensive to have taken place in the decades that I was involved in the financial markets even though both resulted in venerable, much admired and successful companies to collapse in the wake of corrupt and dishonest activities by their employees. However, they are two incidents in which I have direct knowledge of and have studied in depth in later life, turning both into case studies during my graduate studies in Australia. It was in 1992 that I returned to Sri Lanka from Hong Kong to start Forbes Research, one of the first independent equity research houses in Sri Lanka. During my two year stint with Forbes Research, before leaving to Hong Kong again to take up an offer with one of Asia´s top stock broking firms, Credit Lyonnais Securities Asia (CLSA) as their institutional sales head for the Indian sub-continent based in HK, I was a member of the USAID-ISTI primary debt committee that made a series of recommendations which laid the foundation for the change of what was previously known as rupee loans to treasury bonds. This background left me in some consternation when I read the report of the committee appointed by the government to look into the Bond issues of the Central Bank last week. Before I delve more, I have known Central Bank governor since his days as a young advisor to the then Minister of Industries Mr Ranil Wickremesinghe in the early 90´s, and have worked in parallel while he was head of research for Society GeneraleCross Asset Research ( Soc-Gen Crosby) and I was at Credit Lyonnais. I have been in regular contact since 2012 with Charlie Mahendra, a contemporary of my father at the University of Peradeniya and his neighbour at the Ramachandra Hall and an advisor to the Prime Minister Mr Ranil Wickremesinghe. The senior Mr Mahendra tolerated my chatter during the time we both visited the office of the leader of the opposition since 2012. When the first indications of the Bond issue becoming an issue became apparent through a Facebook post, I was amongst the first to defend Arjuna Mahendra – not because I had knowledge of him, but also because it made no sense – and still does not. Lets take the events and construct a timeline taking from the Committee report. The monetary board, where the Central Bank governor is also a member decides to issue a 30 year treasury bond to re-profile the debt service profile of the country "as there is good interest shown by foreign investors". The Board had already decided to do away with the method of direct placements followed before the change of government and to raise funds through direct bond auctions. 1.) That the board disagreed with the cut in policy rates as recommended by the MPC as " is NOT appropriate at this stage, given the rising trend of market interest rates and rising growth of private sector credit" while deciding to maintain rates at the current level and that it was of the view "that issuing 30 year treasury bonds would be favourable at this stage to extend the yield curve and re-profile the debt service", clearly indicating that board considered the policy rates to be the short-term rates and the 30 year bond rate as a separate issue altogether that needs to be addressed differently. The bidding for the Bond of the series number LKB03045C013 opens at 1000hrs. The governor of the central bank, accompanied by two deputy governors is present near the PDD dealing room from 1030hrs until 1056hrs. This information is not in the report but has been gleaned from other reports publicly available and not denied by the Governor or the two deputy governors. The governor and the two deputy governors leave the area at 1056hrs. By this time, nearly 24 bids had come in, including two from Perpetual Securities. The largest bids up to this time came from EPF, (Rs. 1,000,000,000 at Yield net of Tax (YNT) of 10.9998% and Seylan Bank (Rs. 1,250,000,000) at YNT of 11.754%. The two bids from Perpetual, at equal amounts of Rs 250,000,000 each were at an YNT slightly lower than Seylan at 11.55 and 11.75%. The initial funding requirement of Rs One billion had been satisfied by this time. Immediately after the Governor left the dealing room with his two deputies, within the period of four minutes from 1056hrs till 1100hrs when the auction officially closed, Perpetual made four further bids, one at a YNT of 11.997, another at other at 12.24, the third at 12.75 and the fourth at 12.99. All of these bids, for 13 billion rupees were made by Bank of Ceylon on behalf of Perpetual. The treasury Bond Tender committee meets at 12:30 pm (the meeting continued till 13:10pm) and decides to accept Rs. 10,058 million at a weighted average yield (WAY) of 11.73%. The governor did not participate in this meeting according to the minute paper. Following the tender committee decision, the Public debt Department of the Central Bank released a press release giving details of the Auction, providing the coupon rate of 12.50%, the amount accepted and the weighted average yield. 36 bids were received of which only 26 bids were accepted and ten rejected. 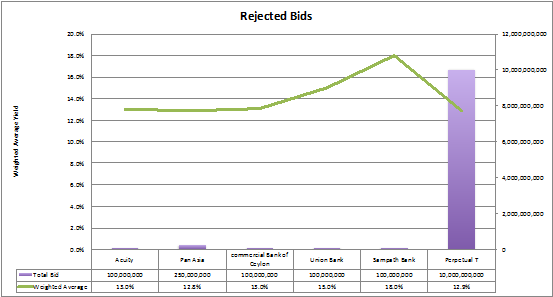 Amongst these ten rejected bids were two bids amounting to Rs 10 billion by Perpetual made through Bank of Ceylon at a WAY of 12.9% and curious bid bySampath bank for Rs. 100,000,000 at a WAY of 18%. Acuity, whose name was mentioned by Perpetual CEO to the committee, saying he also wanted to bid through Acuity but was unable to do so as an Acuity director could not be located, also made a failed bid for Rs. 100,000,00 at a WAY of 13%. Here are the bullet points from the timeline. The market was aware of the government´s borrowing requirement from the 20th of February, the date on which the Finance ministry director general of Treasury Operations sends a letter to Public Debt department indicating the amount to be raised as Rs 13 Billion and apparently indicating that the entirety of the funding has to be through the treasury bonds. The market was aware that the monetary board decided to issue a 30-year Treasury bond to extend the yield curve and re-profile the debt service as of the 23rd of February. The market is aware that the yield curves for the previous four 30 year bond issues are relatively similar and was issued at similar debt service profiles. 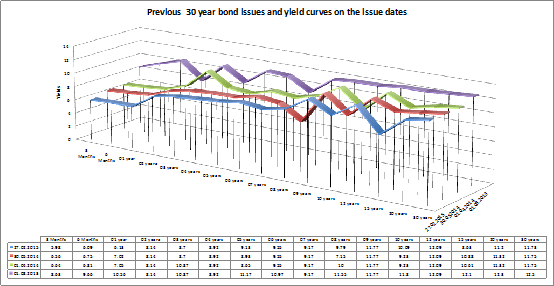 (See illustration – “Previous 30 year bond issues and yield curves on the issue dates “). A short explanation of the yield curves may be necessary here. The yield curves of short to long term treasury bills and bonds simply reflect the confidence level of investors of the country´s growth prospects and the risk the investors are willing to take in giving their money for longer periods of time. The risk profile of a 30-year bond is obviously much higher than that of a 3 month Treasury bill and therefore investors do demand a higher premium or interest rate to give their money for a 30-year period. If a yield curve is flat or is trending downwards – meaning the longer-term rates are lower than the short rates, that indicates an economy that is entering into a deflationary period and there will be no demand for the longer-term instruments. The recent European economic crisis, especially in the economies of Greece and Spain, are good examples where the yield curve reversed and there were no buyers for the long-term instruments. The end February US yield curve and the healthy appetite shown by investors for US 30 year bonds is one of the reasons why economists believe the US has turned strongly around and is today back in the saddle as the world´s strongest economy. Any reasonable investor, having in hand the information that the government needed a considerable amount of money to pay off the debts incurred by the previous regime, that the monetary board intended to extend the yield curve using the 30 year bond and having access to market rates of previous issues and current bond prices can make a reasonable guess as to where the yield will be. It was not only Perpetual who made this reasonable guess – Wealth Trust Securities, HSBC, Pan Asia Banking Corp and Capital Alliance all bid at a weighted average higher than 11.73% with HSBC, Pan Asia and Capital alliance all coming in at 12.5%, slightly higher than the 12.311% WAY that Perpetual received for their accepted bids. There were unreasonable assumptions too – for example that curious 18% bid from Sampath Bank. Others whose bids failed to make the cut-off point, in addition to the Rs 10 billion that Perpetual made unsuccessfully, includes Acuity, Pan Asia, Commercial Bank and Union Bank, who all bid above 12.5%. (See illustrations “Total bids and weighted Average Yields” and “Rejected bids”). There is a crucial assumption that I am making here – and that is what needs much more scrutiny. I am making the assumption – based on information gleaned from various sources – that the market players were fully aware of two pieces of confidential information before the bidding started on the 27th – that is that the government needed more money and that the monetary board had expressed a sentiment that the 30 year bond issue will be used to re-profile the debt profile and extend the yield-curve. It is no secret amongst the primary dealers and the top financiers of the country of the incestuous relationships between the dealer desks of the primary dealers and that of the Public Debt department. Jobs are offered to kith and kin of senior central bank employees by primary dealers to propagate these relationships and there has been a free-flow of information between dealer desks for decades. Perpetual is one of these primary dealers who had access to confidential information since its inception, long before Arjuna Mahendran, whose son-in-law created and launched Perpetual Treasuries, became the Governor. A large number of the somewhat “controversial” private placements or direct placements that the Pitipana Committee alludes to in the Bond issue report, have been placed through Perpetual by the previous regime. As the timeline shows, what is curious is that the large bids from Perpetual and the other high yield bids came after the Governor and the two deputies left the tender committee room. As the committee observes, there is no digital footprint available either at the PDD or of the senior Central Bank officials. It would however be trivial to obtain the Governor´s phone records to clarify whether or not the governor did make any calls to his son-in-law or any other connected individual after he left the dealing room and before the bids came in. This brings us to another crucial part of the puzzle. Other than for EPF, and possibly Seylan Bank, none of the other primary dealers would have been bidding for their own account. Certainly, Perpetual will not have the capital of Rs 15 billion in total to invest in a bond. Primary dealers generally find a client, often an investment fund or insurance company, and then bids on the client´s behalf. Banks, like Bank of Ceylon, extends margin calls to primary dealers and their clients. Given the sovereign status of Central Bank bonds and Treasury bills, such margins are offered at minimum rates and minimum fuss. The Bank of Ceylon dealer is on record on the committee report that he was under the impression the end client for the Rs 13 billion order from Perpetual was an insurance company. Perpetual CEO has denied that he disclosed the end client. A source from Bank of Ceylon indicated to me that Perpetual had been short-selling both equities (which is illegal and is not possible under the current CDS rules) and debt, which is possible under repurchase or REPO agreements, in the week before the 27th auction. There was a differential between the 30-year bond and the short-term instruments – but unless one is extremely aggressive, one would not take the risk of a price miss-match between the short and long-term instruments. Along with this mismatch of information came the completely contradictory statements by former minister Bandula Gunawardana and the former governor Nivard Cabraal regarding the so called losses incurred due to the Bond being placed at a higher yield. While Mr Gunawardana is on record saying this is as high as Rs million 59,000, Mr Cabraal places the loss at Rs. Million 8,000. A detailed calculation made by independent and respected research firm Verite (http://www.dailymirror.lk/78805/central-bank-s-30-year-bond-debacle-what-is-the-loss) has now proved beyond doubt the veracity of these claims, so much so that both Mr Gunawardana and Mr Nivard has stopped mentioning losses. Even the so called “interim draft report of the COPE investigation” (https://archive.org/download/COPEDraftInterimReportTreasuryBondIssueOn27.02.2015/COPE-Draft%20Interim%20Report%20-%20Treasury%20Bond%20Issue%20on%2027.02.2015-_text.pdf) refers only to an “opportunity cost” of Rs 526 million, less than one per cent of the Rs million 59,000 that former Minister Gunawardana claims to be the loss. (Page 11, section 17.B). 3. A weak assumption with regard to market impact and ‘loss’. According to Verite estimates, the only impact the decision to increase the amount from Rs million 1,000 to Rs million 10,000 was an increased interest burden of Rs. 896 million, over a 30 year period, or an interest burden of less than Rs 29 million every year, approximately the same amount former President Mahinda Rajapaksha spent per day for the upkeep of his personal fiefdom. Other analysts have pointed out that this is not a loss, as this increased interest burden actually gets paid back to captive central bank controlled state institutions such as the EPF, ETF and Bank of Ceylon, who were the end clients of the primary dealers, ensuring that money is captured in a loop between Central Bank and state institutions. Both the COPE report and other reports allude to the apparent disregard of the former Central Bank governor to follow established patterns in placing bonds and treasury bills. The guidelines clearly printed in the PDD manual (COPE report, Page 6, section 5, paragraph 4) says that as much as possible, debt must be raised through auctions. This is the established practice in all-major economies in the world and ensures transparency and market rates for investors. On the contrary, the former governor decided to change the system in favour of direct or private placements to explicitly fix the interest rates as per the observations in the COPE report (page 06, section 05 and page 10, section 14). The COPE report also notes that there is simply no transparency in this method of raising debts. (Ibid. page 10, section 14). Information now available through the Central Bank (made available to the COPE committee) tells of the enormity of this very opaque method that reeks of favouritism and possible corruption. Under this method, a few favoured primary dealers were given the opportunity of quoting on behalf of the captive institutions. The modus operandi adapted by the pre-09 Jan 2015 Central bank was to auction a pittance of bonds and treasury bills and then make a round of calls to captive institutions to force them to buy at 500 basis points or half a per cent lower than the price fixed through the auction. These transactions then were executed through just a couple of favoured dealers. (See Private placements vs. auctions.pdf). In 2014 alone, only 3.2% of Rs million 860,700 or as little as Rs million 27,800 out of the Rs. Million 860,700 was auctioned. The rest, Rs million 832,900 was privately placed. 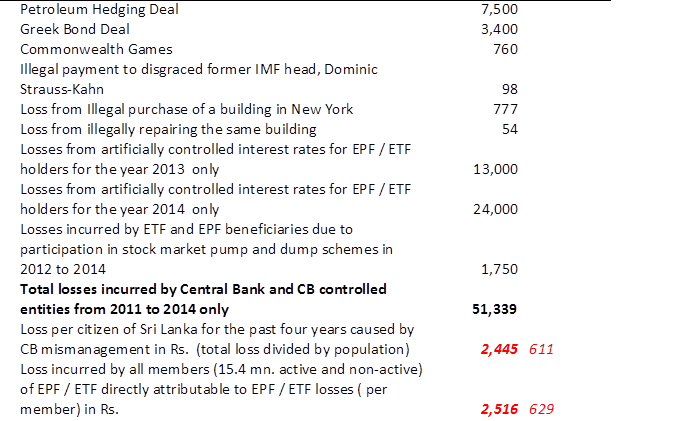 The 500 basis point “discount” means that ETF, EPF and other captive institutions like the Insurance corporation and Bank of Ceylon gets less for the monies they invest and in turn beneficiaries of those institutions, i.e. 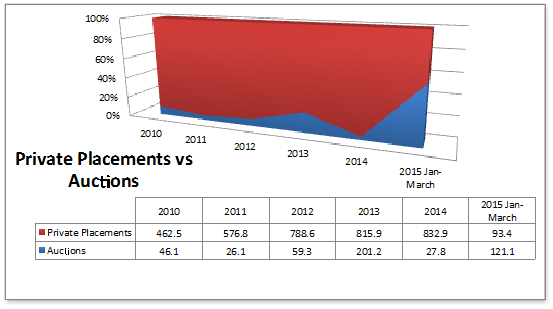 ETF and EPF beneficiaries earn less on their deposits. Central Bank calculates that the loss for the ETF and EPF alone because of this controlled interest rate regime was Rs. Million 13,000 in 2013 and Rs. Million 24,000 in 2014. As the table below shows, each Sri Lankan citizen lost a staggering Rs 2,445 rupees during the past four years in total due to mismanagement and fraud at the Central Bank under the watch of the former governor. EPF and ETF holders alone, the working population of this country, lost Rs 2,516 per beneficiary in those four years or Rs 629 per beneficiary every year. If EPF had invested this Rs. 2,516 in the February 27, 30 year bond issue at an interest rate of 12.5%, using the erroneous method of calculation used by former minister Bandula Gunawardene, each member would earn Rs9,435 in interest alone at the end of that 30 years, without compounding the interest. NOTE: Figures in red are in Rs. When one speaks with the primary dealer community in Colombo, one gets a strong impression that the incestuous relationships that the current opposition alleges against the current governor, Arjuna Mahendra, are not unique, but endemic in the community. For example, its now established that former governor´s sister served for over three years as a director of the holding company of Perpetual Treasuries. Another director of the company, Ranjan Hulugalle is allegedly closely connected with Anura Fernando, a well known figure in the financial circles and a former partner of the former governor Cabraal whenCabraal family held equity in the multi-level marketing scheme connected with Malaysian high profile investor Vijay Eswaran (http://www.thesundayleader.lk/2010/12/26/the-return-of-vijay-eswaran/). Over the years, many allegations have been made against Mr Fernando regarding the proprieties of his deals, but not much has been proven. Mr Fernando was closely linked to the controversial deal in 2012 when the National Savings Bank, under the watch of its former chairman Pradip Kariyawasam, purchased the The Finance Company (TFC) in what appeared to be a classic pump and dump action. The previous government was forced to cancel and reverse the deal. Primary dealers claim that Perpetual showed an extraordinary growth since its start in 2013. For example, their dealer license had been granted in just two months ‘time when most had to wait for over two years. While Perpetual did not show much wins in the auctions, dealers allege that they did have a steady flow of income as the lead dealer for ETF and EPF in the primary money markets where most deals (96% in 2014) were done in the opaque and paper-trail-less direct placement market. The government of Mr Ranil Wickremesinghe has promised a through investigation in to whether or not Perpetual made use of inside information and if so, as to who are culpable. In a recent interview, Mr Wickremesinghe said that he would be appointing select committee if his government returns to power post- august 17 and that he will appoint an opposition member to head that committee. The Aegean stables that Mr Wickremesinghe inherited on Jan 09th of this year are not just messy, smelly, intricate and hides not one but many monsters, it needs a herculean effort to clean.